While the Gem State continues to grow, many people are also leaving Idaho for neighboring states. BOISE, Idaho — Many are well-aware that Idaho is one of the fastest-growing states in the nation, but where exactly is everyone coming from? New data confirms the common notion that many are fleeing the Golden State. Also, statistics from the U.S Census Bureau shows what states people are leaving Idaho for. The Idaho Department of Labor analyzed statistics provided by the Census Bureau between July 2017 and July 2018. Many from across the western U.S. moved to Idaho, led by California and followed by former residents of Washington and Utah. 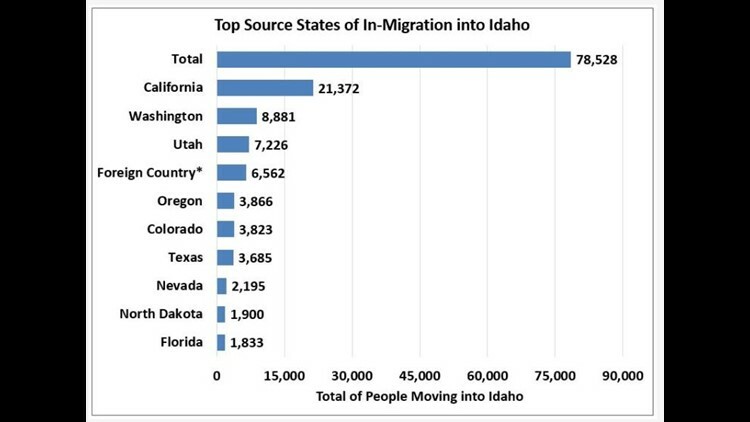 In that time range, 21,372 people from California moved to Idaho. In comparison, 5,626 people left the potato state and moved to California. The net increase from California accounted for nearly 60 percent of all net migration into Idaho. The net total migration, the number of people moving into and out of Idaho, is 26,246, according to Census data. 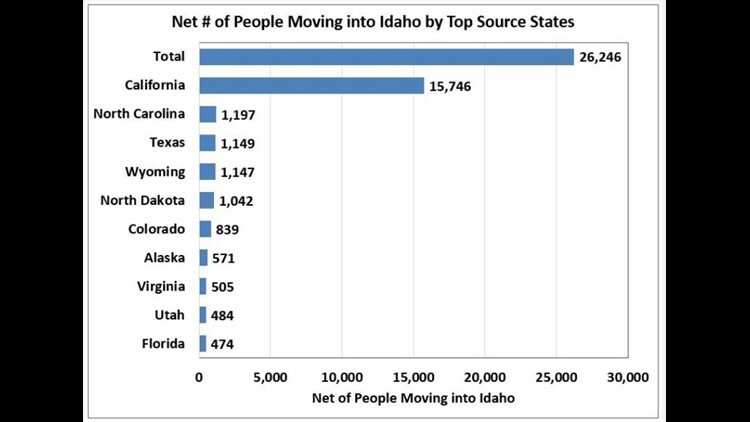 This graph shows the net total, the number of people moving into and out of Idaho, by state between July 2017 and July 2018. More people moved into Idaho from Washington, Utah and Oregon, but about the same amount of people moved to those states from Idaho to those states, bringing the net migration down. In net migration, there were more people that moved to Idaho from North Carolina, Texas and Wyoming than Washington, Oregon or Utah. This graph shows where people are moving to Idaho by state. Washington, Utah, Oregon and California accounted for nearly half of where people were moving to from the Gem State. Totaling 41,345 new residents in Idaho. Idaho also had 3,733 people move from North Dakota and Florida to the gem state. Another 6,562 people moved into Idaho from foreign countries, but no information from what specific countries are available. 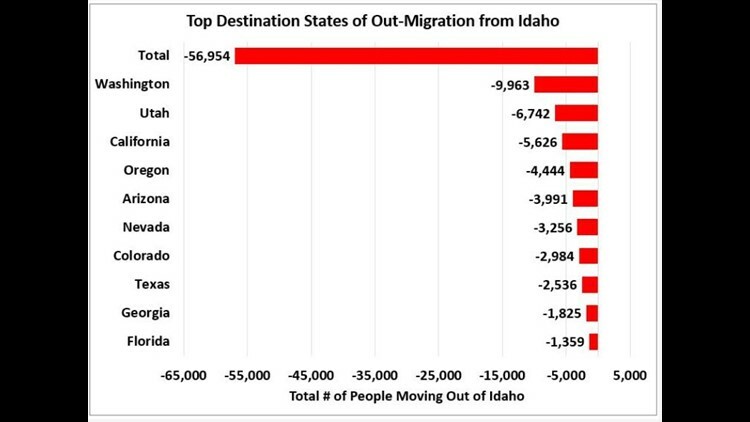 Even with all of the migration into Idaho, nearly as many people moved out of Idaho. There 56,954 people who moved out of the state, mostly to Washington, Utah and California. This graph shows how many people are leaving Idaho by state, according to data by the U.S Census Bureau. The population growth didn't necessarily equal a stark increase in workforce growth, increasing by 1.4 percent in Idaho, according to the Department of Labor. Nevada and Arizona saw greater workforce growth, with increases of 3.5 and 3.2 percent. Wyoming saw a decrease of 1.9 percent, while Montana saw zero change. Idaho is tied with Nevada for the highest growth rate in the nation, at 2.1 percent, between July 2017 and July 2018. The national growth rate was .6 percent. Wyoming was one of five states that experienced a population decline.